1. Chop the chillies, garlic cloves and ginger. Blend them along with chopped coriander and lemon juice to make coarse paste. 2. Heat 3 tablespoon oil in a pan. Add sesame seeds. When sesame seeds crackle, add the chilli coarse paste and turmeric powder. Fry for 30 secs and turn the heat off. 3. Mix all the flours together in a mixing bowl. Add the jaggery and salt. Mix well. 4. Add the sesame seeds mixture to the flour. Mix well. 5. Add the curd as require and knead the stiff dough like chapatti dough. 8. Heat the oil in a pan. When oil heated, deep fry vada in hot oil on medium heat. 9. Make sure to flip the vada when the vada is puffed. So the vada will be evenly cooked and turn to golden brown colour. 10. Drain excess oil in kitchen paper. Store them in an air tight container, once they cooled off. 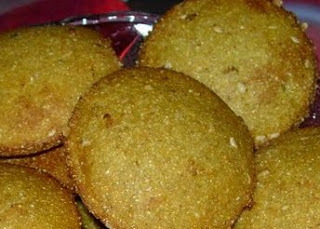 Serve the gujarati vada hot with tea or curd chutney.